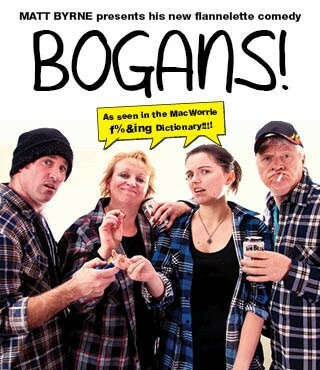 Matt Byrne’s Fringe smash hit Bogans is heading for Holden Street – where else would Bogans go? 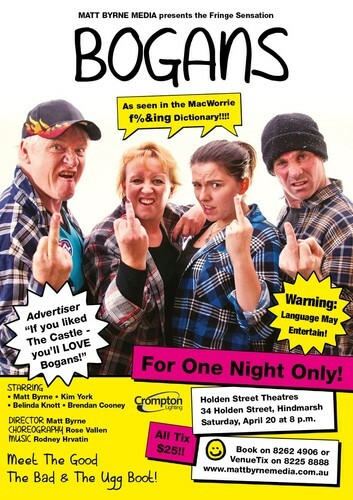 The Wingnut family of Bogan-Brompton will take over the Holden Street Theatres at 34 Holden Street, Hindmarsh on Saturday, April 20 at 8 p.m.
Errol, Cheryl and their kids Sharlene and GT proved a big hit with Fringe audiences, and they’re delighted to have a venue closer to home. They rule the roost in Dipstick Street, Bogan-Brompton, where life with Centrelink support is sweet, until developers decide to move in to get the residents out and the yuppies in! “We started out looking for everyone’s inner Boigan and discovered everyone was a Bogan,” he said. Bookings can be made and further details found at the website above.